An overview of the history, strengths, and unforeseen weaknesses of the Americans with Disabilities Act. Shaw’s smart, comprehensive nonfiction debut deals with how the ADA, signed into law in 1990, drastically changed the landscape of American workplaces. Prior to it, the physically disabled faced a host of obstacles if they wanted to join or return to the workforce: they often encountered buildings that they couldn’t enter—it’s startling to remember, while reading this book, how recent entrance ramps and other handicapped-access features are—and they faced the perception that they were lesser employees or even lesser people. Since the ADA’s passage, this situation has changed greatly, but Shaw believes that, in many cases, the pendulum has swung too far in the opposite direction—particularly as the concept of “disability” has expanded to include psychological and emotional disorders. This has led to increased possibilities for fraud, the author contends, which has brought American employers to a crossroads: “We need and want to do what’s right for workers, while still adhering to the ADA,” she writes. “However, the influx of requests increasingly include those filed by workers who are not disabled.” She goes on to offer a systematic analysis and playbook for employers who might face overstated or false disability claims. 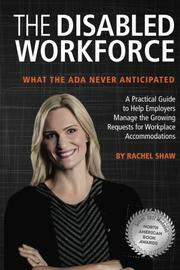 She also specifically runs through the kinds of accommodations that employers are legally obligated to provide under the ADA and what may or may not constitute “reasonable accommodations.” Shaw effectively takes readers through different situations that employers may encounter, including dealing with especially litigious claimants and outright malingerers; her writings on mental disabilities, in particular, will likely be very useful. Shaw’s prose is clear and encouraging throughout, and she adroitly manages a tricky balancing act between skepticism and advocacy. As a result, she comes off as both a champion of the disabled and a mentor for businesspeople looking to avoid fraudsters. An invaluable guidebook to disability law for American employers.